Opening Jackie Cameron School of Food & Wine has meant long hours and a lot of pressure. I thought a chef’s life was hectic; opening a business takes demanding to another level. I’m working earlier in the mornings and later and night, and although I have managed an hour a day in the gym, there are other aspects of my life that require attention. I was nudged into the physical phase when a caring ‘someone’ left a gym contract in my Christmas stocking. Another positive pointer towards my resolve was Chef Elaine Boshoff, - my right-hand person; and sometimes my left hand too – unexpectedly, and to my relief, joining the team. Quite out of the blue she has become a fitness freak and I’m determined that she won’t show me up... so to the gym it is. While training, Elaine is in charge because her sister, Yvette Trollop, a personal trainer in Durban, designed our programme, so it’s a case of my saying ‘Yes Chef’, in the gym because I know my limitations. If Elaine is anything to go by, her sister must be pretty determined to get top results for her clients. I believe you can’t out exercise a bad diet so this month’s recipes relate to health and fitness. I know you’ll enjoy the super-fresh asparagus-avocado-and-pomegranate ruby salad with thick dollops of cream cheese. Over this I suggest you drizzle a simple lemon vinaigrette. Asparagus, avocado and pomegranates help alleviate anxiety so, during stressful times you now know what to serve for dinner. The sheer beauty of these ingredients promises to induce a relaxed ambiance! It will take some serious chocolate-tart recipe to surpass my chocolate tart with raisins, and remember, there’s no reason to change a recipe unless you can add, considerably, to the flavour. Those with high blood pressure will be pleased to know that dark chocolate as well as raisins help reduce this condition. Ginger, fresh mint and lemon make the perfect, refreshing iced tea on a hot summer’s day. Add a few fresh-berry ice blocks for a splash of colour. (I can’t resist adding these same ice blocks to my gin and tonic) Ginger, mint, lemon and berries help reduce nausea so this recipe is dedicated to my many friends who are pregnant right now. If you are having a problem sleeping then bananas should form part of your dessert option. Give me a whole banana any day but a mushy banana is a ‘no-go’ for me. I do, however, enjoy banana white-chocolate ganache. In the past I made tiny Smartie-sized bites which we covered in hand-tempered chocolate and served to accompany a dessert. For home consumption I suggest eating it by the spoonful. The long holiday break might be making it difficult for you to get back into your every-day routine. A blueberry, coconut-milk and walnut smoothie promises to revitalise you and help restore the focus you need for a day in the office. My almond-and-potato dauphinoise (fancy name for a cream-based potato bake) is a firm favourite and I wish all chefs would put as much love into cooking as Elaine did when she made this for our recipe test and photo shoot. Hands-down it’s the best daupinoise I have ever eaten. It has the perfect balance of crunch to creaminess. Elaine and I have a love affair with potatoes which means we could never go on the Banting Diet. Potatoes and almonds help relieve headaches so I know what I’ll do when next I feel one of those coming on. Here is to a happy, healthy 2015! 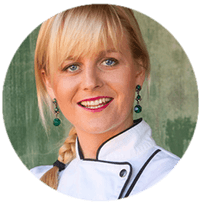 Jackie Cameron, soon-to-be owner of Jackie Cameron School of Food & Wine situated in Hilton, KwaZulu-Natal - email for enquires. For the latest on local foodie news add me as a friend on Facebook. Find me on Twitter - @jackie_cameron and Instagram: jackiecameronincolour. Food styling and recipe development, Elaine Boshoff.